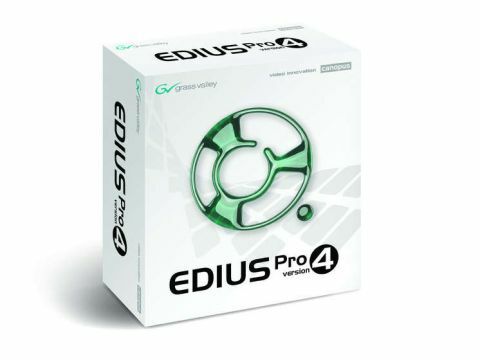 Edius is an extremely solid and reliable workhorse for video editing. Version 4.5 introduces some useful new tools but, more importantly, a friendlier, more adaptable user interface and a whole host of shortcuts and productivity tools to make the editing process as quick and intuitive as possible. The reputation of Grass Valley (formerly Canopus) for rock-solid, well-designed video editing tools is second to none. But it's a reputation that has been earned more through the company's hardware development than its software. That's not to say that Grass Valley makes poor software - far from it - but somehow it's easier for them to market realtime boards and graphics accelerators than editing interfaces and encoders. Edius, therefore, seems to be enjoying only niche market success. After a slightly tepid reception on its initial release, the development team did some extensive and worthwhile research for version 4, to make it a very strong competitor to the likes of Premiere Pro and Liquid. Version 4.5 is, apparently, a minor update for Edius Pro, and available as a free download for registered users of Edius 4. Beneath the hood, however, you'll find an extensive rebuild and a great host of new features - most of which aren't even mentioned in the manuals! Changes in Edius 4.5 are evident straight away - from the new desktop icon, to a new interface for launching old projects or starting new ones. The choice of project presets is more sensible and intuitive than before with easily accessible settings for high and standard definition video formats. Once into the main interface, we find that everything appears brighter and friendlier, with a redesigned interface which is altogether more punchy and visual. There's also a comprehensive panel for customising the main user interface, assigning buttons, tweaking playback controls and overlay options, and setting keyboard shortcuts. Window layout and even timeline and render settings can be tweaked. Once set up, all the above adjustments can be saved as a template for future use. Edius' core workflow remains unchanged - so there's no new learning curve for existing users - and even newcomers with some experience in prosumer-level editing software will feel right at home with its visual approach to three-point editing, using source and edit monitors (or a single monitor toggled between the two functions). In our tests, Edius proved itself to be very fast and responsive, unlike many other programs that take time to stop and think about each command when projects get complicated. Overall performance for DV format work was superb on a 3GHz dual core system, giving the type of real-time playback that we would once only expect from expensive hardware acceleration. HDV monitoring was excellent too, with the most extreme filters playing back smoothly, sharply and confidently - albeit only on the computer monitor. HDV playback from the timeline isn't fed out via OHCI FireWire ports, but that's the case for all video editing programs at present. Naturally, Grass Valley is keen to promote its NX real-time boards to work alongside Edius 4.5, offering good real-time performance and playback on external monitors. It's a costly package, but with bespoke systems costing from £3,300 it could be a tempting prospect for the working professional. A cute addition is new support for Behringer's B-Control BCF2000 fader, a physical control surface costing around £120. The BCF2000 provides eight physical motorised sliders with which to adjust sound levels on the timeline. The investment could be worth it just to watch the sliders move on their own during playback (don't let it be said that we're easily pleased!). Titling tools remain largely unchanged, but still powerful and versatile with the inclusion of Title Motion Pro, which offers extensive control over the style of text and even some decent animation tools once you get used to the somewhat awkward keyframing methods. A fundamental addition to Edius' toolkit is integrated DVD authoring. It's a little primitive compared to the competition, offering no motion menus or support for additional audio tracks or subtitles. Unlike the integrated authoring tools of some editors, however, Edius will allow additional video files and sequences to be imported into a single DVD build - slideshows aren't directly supported as such, but it shouldn't be a huge problem to create a slideshow sequence on Edius' timeline. Encoding settings can be customised for each individual clip too, allowing more data to be assigned to the main feature than to 'extra features'. Menu templates are a little tacky, but serve their purpose for making quick and dirty presentations. Like the authoring tools on other video editors, they're great for making quick viewing copies of work for clients, but most working pros will still find themselves using dedicated authoring software such as DVD Studio Pro or Encore DVD. Exporting HDV to tape is helped by the inclusion of Segment Encoding, which only reprocesses pieces of footage which have been cut between I-frames, or to which effects have been applied. The result is a faster transport stream build for export to tape. Also useful is a batch export feature, allowing users to encode to multiple media formats, such as HDV, DVD-compliant MPEG and streaming web formats in one session. There's also a direct integration between Edius and Grass Valley's excellent encoding program, ProCoder3. Edius might not have quite as many bells and whistles as Adobe Premiere Pro, but Premiere's advantage lies in features that many editors won't actually use. Edius is a serious and reliable workhorse with a newly streamlined workflow designed to appeal directly to the jobbing professional.